Monday night: Steady clearing. Lows in the 60s. 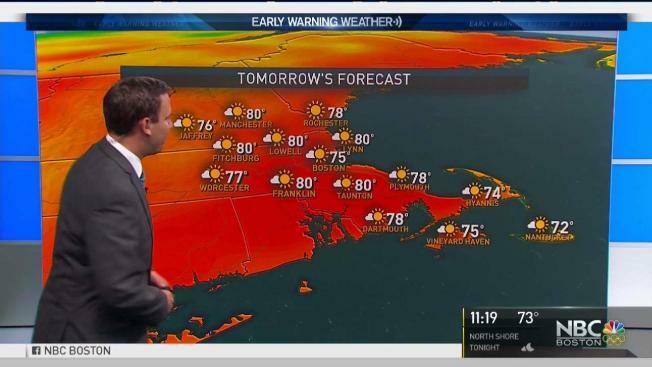 Tuesday: Warm, sunny. Highs in the 70s. Nate was once a formidable hurricane when barreling into the Gulf of Mexico coastline this weekend. Now, with the storm circulation weakened and winds diminished, Nate is technically no longer but the associated pocket of warmth and water remains. The result for New England is palpable on this Columbus Day — sultry humidity in Southern New England that leaves no doubt this air is of tropical origin, and periods of showers, rain and downpours through pockets of fog that will continue across New England through the day. Heaviest rain amounts of greater than an inch will fall in Northern New England, with just a fraction of an inch in Southern areas... but a gray and damp day for one and all. Keeping rainfall amounts in check means flooding is unlikely for Columbus Day travelers, though some big puddles should be expected, and Red Sox nation should expect a ball game played through recurring showers that will remain mostly light, picking up the pace by late in the game into the early evening. Though there’s no damaging wind to speak of, gusts will exceed 30 miles per hour in the mountains and along the South Coast, and while this will pull some of our dazzling leaves from their perches, plenty of colors will remain even after today. Skies clear overnight and humidity decreases, but warmth remains beneath dazzling sun Tuesday, with highs of 75-80 degrees. A sharply cooler air sweeps across the region Wednesday as a northeast wind blows in from the Atlantic, holding temperatures in the 60s, with cooler fall air dominating through week’s end. The early call on the weekend is a great start Saturday, a building chance of showers Sunday, and another shot of fall air to start next week in the exclusive Early Warning Weather 10-day forecast.